Welcome to the Paradigm Naturopathic Kids Triathlon! This fun and challenging triathlon will take place on September 8, 2018 at the shores of Okanagan Lake in Vernon B.C. Kids and youth, ages 6-23 years, will swim, bike, and run distances that are specific to their age group category by December 31st of 2018. Kids age 3-5 years can participate in a Splash and Dash, which includes a short swim followed by a run through the finish chute. Many children will be participating in a triathlon for their first time, and will be directed through the course by helpful volunteers. Parent volunteers are needed to assist on course to ensure a safe and fun event for everyone. Participants registered before August 9th will receive a T-shirt. All recreational participants will receive a finishers medal! Please note that for participants age 13-17, there are two category options. Experienced athletes, that have completed the TriBC Draft Legal certification, may register for a Draft Legal category (Youth 13-15yrs, Junior 16-19yrs, U23) and Provincial Championships (Junior & U23). Awards will be offered for top three male and female athletes in each draft legal category. Recreational and first time athletes 13yrs+, should register in the 12-13 or 14-17 age group categories. Registration fees are $30 for participants age 6-17, $40 for Draft Legal 13-23yrs, and $10 for Splash and Dash for children 3-5 years of age. Sponsorship from local businesses, and the commitment of the many volunteers who run the event make it possible to keep our entry fees low. Please check out these supportive businesses on our website, and be sure to support them in return. All participants must have Tri BC membership. Registration will direct you to add single-day Tri BC membership if required. We hope you are as pumped as we are for the 6th Annual Paradigm Naturopathic Kids Triathlon this Sunday September 8, 2018! Please read this email thoroughly, important race information is included. 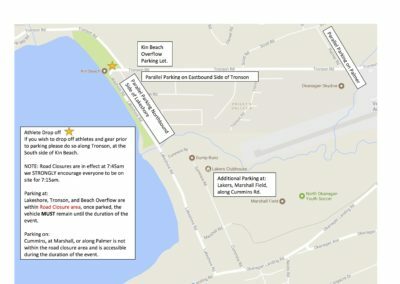 To provide a safe race course, road closures will be in place on Tronson Road and Lakeshore Road. Rules are here. Please review. Course maps are on our website. Slight adjustments may occur between now and Friday evening, after we re-measure & verify courses this week. Please see parking maps available here. Note: Vehicles parked within the road closure area, must remain until all athletes have crossed the finish line. 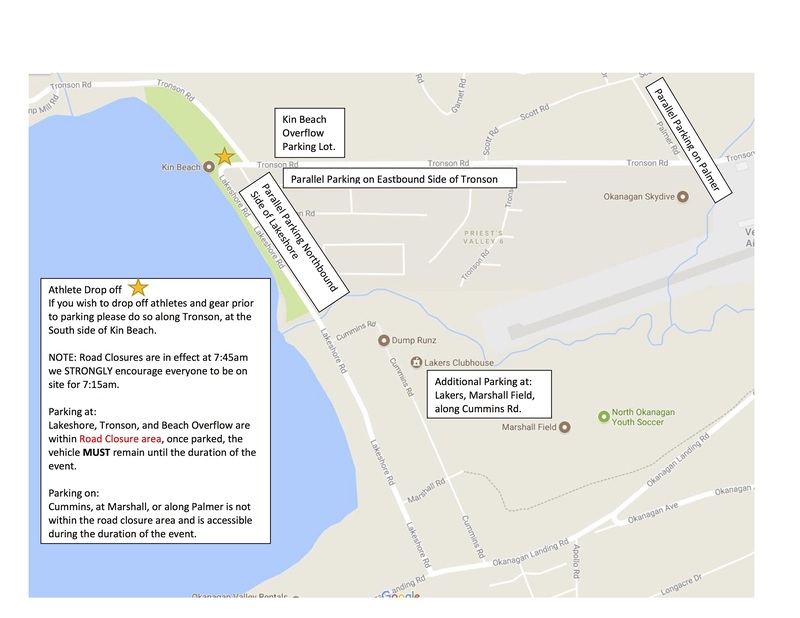 Athletes may be dropped off along the south edge of Kin Beach Park, prior to 7:45am. Those registered on or before Aug 9, will receive an event Tshirt in their race package. Extra shirts may be available for sale, cash only. These will be offered first come, first served, at package pick up on Saturday. Athletes/families should plan and be prepared to be at the race site from 7:15am-11am. If your schedule has changed and you are no longer available to be on race site during these times, please let us know you’d like to be removed from the start list. 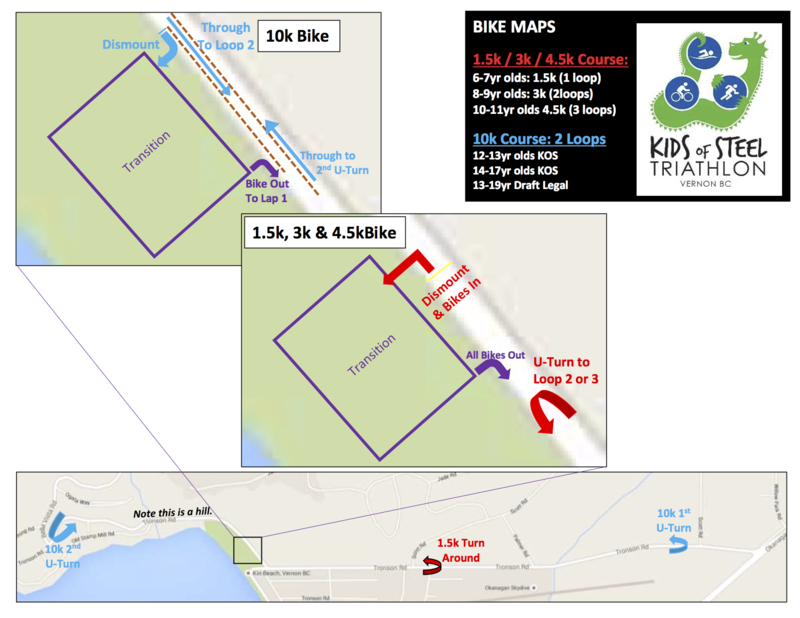 6:30-7pm Mandatory pre-race briefing at Kin Beach Park. Package pick up 5-6:20pm. 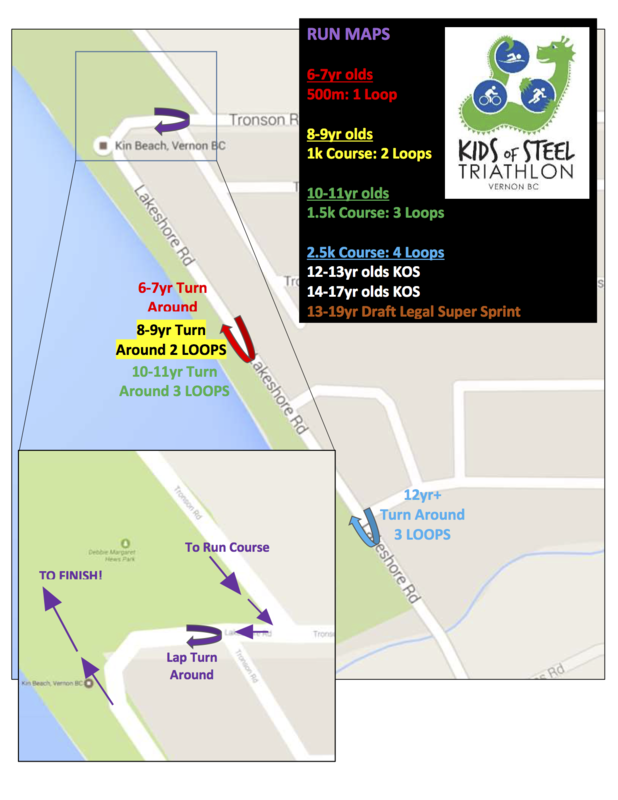 -Timing Chip Pick up for all DL & Kids Tri participants. No timing chips needed for Splash n Dash. -TriBC SuperSeries /Draft Legal transition open for set up. 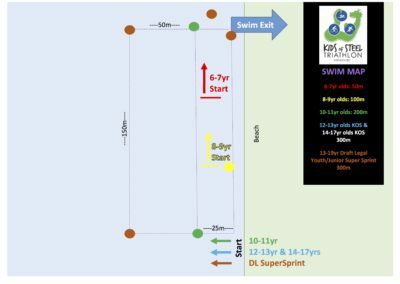 -6-17yr Triathlon transition open to athletes, for set up. No parents/spectators allowed. Many helpful volunteers will be available to assist athletes with set up. Volunteer sign up is still available here. 8:00-12:00am Transition Closed. Races in progress. No one in, no gear out. Please respect races in progress by staying clear of the race course, including transition area, and leaving volunteers free and available to do their jobs for other heats during this time. Other athletes will do the same for you. 7:50am 6-17yr Triathlon Pre Race Meeting, at finish line. -Athletes should be prepared to start anytime after the previous wave. -Once your wave has been marshalled, athletes need to be wearing their swim cap and must stay with their wave. -Athletes who have been included in the headcount on the beach, will be expected in our swim exit athlete count. We will call off races and begin a water search if numbers don’t match. This is not the time to visit the bathroom, or find friends on the playground. Athletes choosing to withdraw themselves anytime after the headcount, must notify an official, hand in their timing chip, and will not continue the race from that point. Waves may start early. A few differences for these lil athletes! no bike needed, but they are welcome to bring one and ride around the north side of the park while waiting for their race. Swim cap and number will be provided. Timing chip will not. Waterwings, puddle jumpers, life jackets welcome. Parents welcome to assist and follow along. We will also have some of our local youth & junior triathletes volunteer to lead these guys through the course and help them out. ‘Transition’ for Splash n Dash is a purple carpet outside of the regular transition area, where athletes will leave their shoes before they swim. Most first time parent worries can be calmed by volunteering. If you are anxious about your athlete being out on the course without you, or ensuring they have done the correct number of laps, sign up to volunteer on the bike or run course, and help point all athletes in the right direction. Furry friends stay at home on race day. Kin Beach is not one of Vernon’s many dog parks and beaches. Spectators stay off the race course. It’s not safe to have siblings, parents, grandparents or friends, swimming, cycling, or running alongside participants. Constructive feedback is welcome from all current and future volunteers and coaches. We do make slight adjustments each year and are keen to hear how you can help us improve the safety, inclusivity or overall experience provided by the Vernon Youth Triathlon Society. Participation waves are intended to be safe, fun and inclusive experiences for kids. Triathlon rules are enforced as learning opportunities to keep kids safe. We do not post results at race site, we do not award podium prizing for participation events. All participants are encouraged to celebrate their finish at the finish line with a finishers medal! Results will be available online, live by Sportstats, however may not be updated and verified for a few days post-race. bring extra shoes. You’ll leave your runners in transition before 8am and need something to wear before your race. ‘Transition’ is the area where you change activities and equipment from swimming to biking and then biking to running. Everyone sets up transition before 8:00am with stuff they will need during the race (bike, helmet, shoes, race number). Stuff you need before your race, for the swim, or after the race, does not stay in transition (goggles, race provided mandatory swim cap, extra shoes, swim/race wear, towel, dry clothes, snacks, bike tools, etc…). Loose/excessive gear in transition is a safety hazard, please keep transition simple and basic. check bike and helmet early this week. Athletes with helmets that are not properly adjusted will be stopped by volunteers and race officials to make corrections. Bikes must be in good working condition, bar ends must be plugged, brakes must work. Pump tires, clean chains, check shifting. Most local bike shops will happily provide a quick safety check for free. Go early in the week, in case something needs to be corrected. Bring extra snacks, sunscreen, water bottles, warm clothes, towels. First timers are encouraged to visit package pick up between 5-6pm on Saturday, the race director and local coaches will be on site to answer all of your pre race questions. Please review the TriBC Youth amendment of the ITU competition rules in effect for this season. Be body marked (race morning). Wear the race provided swim cap for the swim. Wear the race provided wrist bands for the entire event. Wear the race provided timing chip for the entire event. Return the timing chip to finish line volunteers, immediately upon completion. Missing chips will be billed back to the participant. Walk/run their bikes in transition. “Mount” and “Dismount” lines and volunteers will clearly mark areas where athletes may ride. Parents and athletes are encouraged to explore transition layout and these areas before transition closes at 8:00am. Know their wave colour and how many to complete. Be able to ride a two wheel bike (not applicable for Splash n Dash). No training wheels allowed. Be comfortable & confident swimmers for their race distance. Participants 10 & over should be able to continuously swim 1.5 times their race distance, in a pool, prior to attempting an open water swim. We do have lifeguards and water support available, bur for the safety of all athletes, it is recommended that swimmers be able to swim a minimum pace of 100m in 4minutes, for their race distance. DO cheer for everyone! We like a lot of positive noise! DO leave furry friends at home. DO allow our volunteers and officials to do their jobs. DO stay off the race course and out of transition, these spaces need to be kept clear for races in progress. Parents are NOT allowed in transition. DON’T complain. This event is put on by volunteers. Suggestions on how we can improve this event, are welcome and encouraged. Please contact the Race Director at lauramedcalf@yahoo.ca to volunteer to implement your solutions. Stuff you need for the swim stays with you until you start. Stuff you need for the bike and run get set up and left in the secure ‘transition’ area. Transition is open for set up until 8am, closed during races, and re-open to collect gear after the last participant of the day has started the run. Bring extra clothing and shoes. Your runners will be set up in transition, ready for you after the swim. A second pair to wear while you warm up, and play while waiting for your wave start is helpful. Untie shoe laces and unclip bike helmet while setting up in transition – so they are ready to put on after the swim. The easiest race attire, is something that the participant can wear for the swim, bike and run. For girls, this may be a swim suit. For boys, this might be swim trunks and a swim/sun shirt. Other options include: tri shorts & tri top. Swim suit & tri top. Swim suit & pull on a t-shirt after the swim (before your helmet!). You will need a way to attach your race number (bib) to yourself for the run. This can be as simple as using pins to attach to a t-shirt that gets pulled on after the swim. Another option is to purchase a race belt, which holds the number and is clipped around the waist. Some athletes will hand craft a race belt, by cutting a thick elastic waist band out of an old pair of underwear, and using pins to attach the bib number. Make sure you have picked up your race package the day before the event. 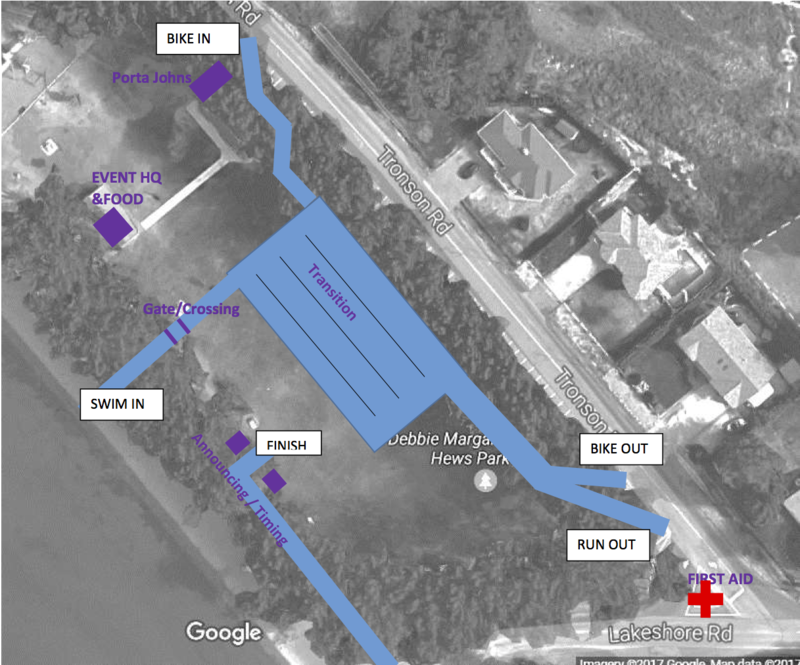 Race package pickup is on Friday June 24 from 5 – 7 pm at Kin Beach Park. 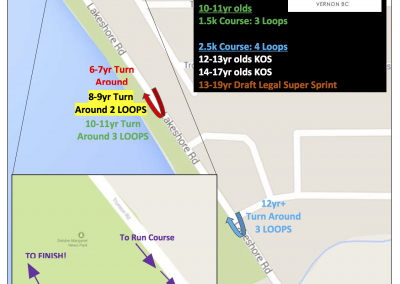 Youth/Junior Draft Legal Pre-Race Athlete Meeting 6:30pm mandatory meeting. ONLY out of town participants may pick up race packages on race day from 7-7:45am. They are also expected to bring completed bike inspection form. Arrive early, it takes time to set up your equipment in transition. Transition will be closed to Draft Legal athletes at 8:00am and to all KOS athletes at 8:15am. No one will be permitted back into transition after this time. There is a mandatory pre-race meeting for all athletes and parents at 8:30 am. near the transition zone. Be mindful of others and try not take up too much room. 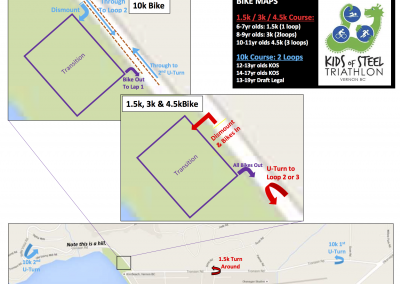 Donʼt forget anything – you will not be allowed back in to the transition zone once you have set up. Always walk your bike in transition – even when you are setting up. Always follow the directions of the volunteers in the safety vests. Post race snacks will be provided for athletes only. Parents and siblings should bring their own snacks. Athletes 6 years old and older race without parental assistance. Athletes 6 years old and older may not be accompanied anywhere on the race course including the transition area. That is the job of our volunteers. This will also ensure a safe and positive experience for everyone. Parents are not permitted in transition during the race. This will be strictly enforced. Being in transition while the race is going on disrupts the athletes and is unsafe. We encourage you to cheer your athlete on as they race, but it is CRITICAL that you stay off the race course while the event is in progress. Please refrain from cycling or running along with your child. Cheer on all athletes- we encourage lots of noise! Once all the athletes are off the race course your athlete will be permitted back in the transition zone to collect their gear. 5-7pm package pick up at Kin Beach. Mandatory for Vernon/North Okanagan Athletes and Draft Legal athletes. 6:30pm Youth/Junior Draft Legal Pre-Race Athlete Meeting. 7:00-8:15am Transition Open for Set up. 7:00-7:45am Race Package Pick up for Out of Town Residents Only. 7:00-8:00am Athlete Timing Chip Pick up. 8:00am Full Road Closures of race course in Effect. 8:00am Youth/Junior Transition Area Closed. 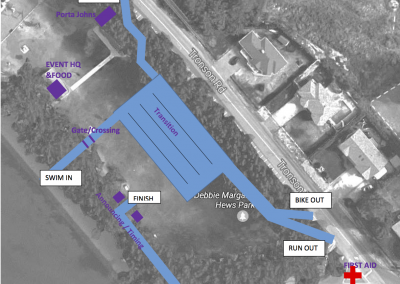 8:15am Transition Area Closed to ALL Athletes – NO TRANSITION ACCESS 8:15am-11am. 8:35am KOS Jazzercise Warm Up. 9:15-10:40 KOS Wave Starts, Oldest to Youngest. 11:00am Transition Re-Open to collect gear. Please plan and prepare to stay and enjoy the whole morning, regardless of what time your athlete is scheduled to race. We ask that all participants and parents plan to be on site from 8:00am to 11:00am. Please note that start times are approximate only. Athletes should be attentive and ready to start any time after 8:50 am. Athletes should know what their colour is and how many laps they need to complete on the course. If you would like to be a volunteer we could still use a few more on the bike course. Let us know if you can help out. What Is A Splash n’ Dash? A Splash n’ Dash is a FUN, fitness activity involving swimming and running (consecutively), with a short period of time required to move from one sport to the other, called a TRANSITION. In a Splash n’ Dash, every finisher is a winner. Everyone who swims and runs a little receives a gold medal and snack at the finish line. The #1 rule at the finish is… “turn around and cheer the next person to the line”. Who Can Participate? Anyone age 5 and under. • Swim or (run): in shallow water for 100 meters. Flotation devices are permitted but will not be supplied. Volunteers assist in the water but parents may assist if the child is not comfortable being helped by a volunteer. • Transition (change area): flat ground where kids will put on their running shoes. • Run: spectator friendly, 100 meter run through obstacle course. • Finish: every finisher receives a gold medal, t-shirt (if registered before TBD ) and post-race snacks.